Fig. 1. 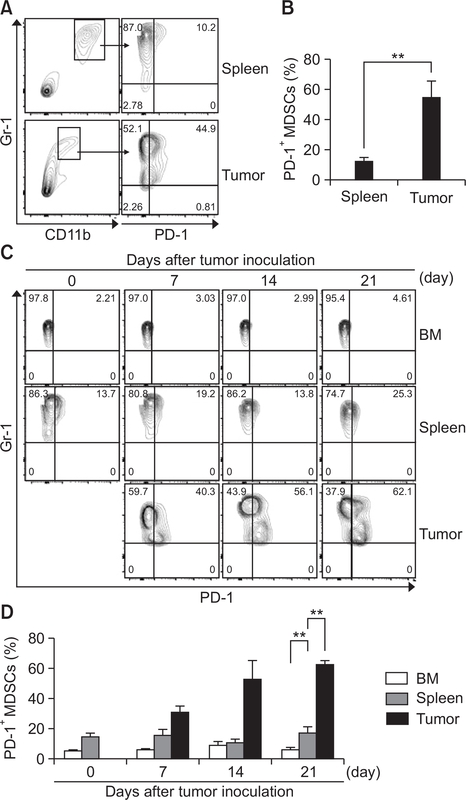 PD-1 expression is increased in tumor-infiltrating MDSCs. (A–D) After tumor inoculation, splenocytes and tumors were stained with specific antibodies against CD45, Gr-1, CD11b, and PD-1 and analyzed by flow cytometry. (A) Cells were gated on CD45+ Gr-1+ CD11b+ (total MDSCs) from splenocytes and tumors at day 14 after 4T1 tumor inoculation. Dot plot show PD-1 expression in CD45+ Gr-1+ CD11b+ cells. (B) The graph represents the percentage of PD-1+ MDSCs within the whole splenocytes and tumor. (C) The cells from bone marrow, splenocytes, and tumors obtained from 4T1 tumor-bearing mice at various time points were stained with specific antibodies against CD45, Gr-1, CD11b, and PD-1 and analyzed by flow cytometry. (D) The graph represents the percentage of PD-1+ MDSCs within bone marrow, whole splenocytes, and tumors (n=3). **p<0.01.